New Year's Day frolics, for some. Others prefer sausages. ‘For age is opportunity no less than youth itself, though in another dress, and as the evening twilight fades away, the sky is filled with stars, invisible by day.’ Henry Wadsworh Longfellow. ‘Peter Pan had the right idea.’ Marigold. 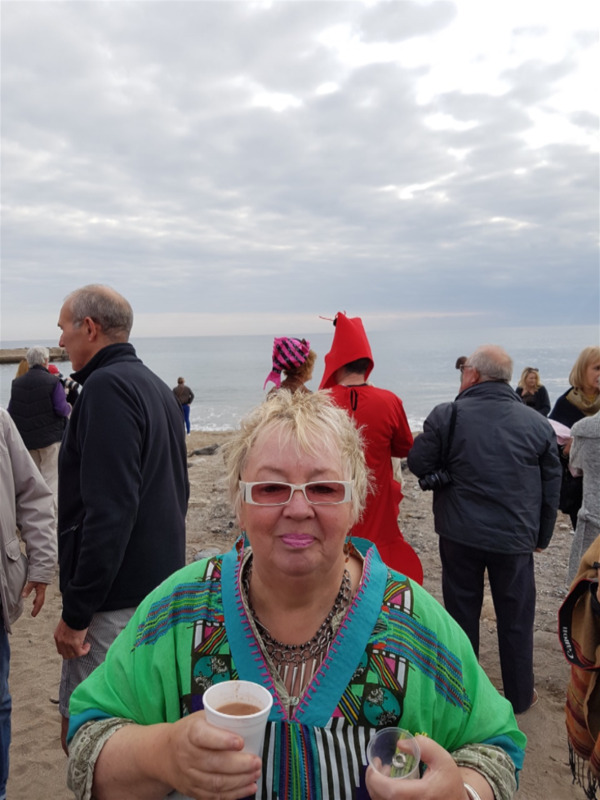 New Year's Day and there's a charity swim on the beach in aid of abandoned cats and dogs. Fancy dress is optional. That's the swimmers, not the cats and dogs. A good cause then and one we’re happy to support. As spectators, but not as participants. Marigold has oodles of common sense, but sadly I have been slow to grasp the concept. Even so, when pressed to disrobe and fling myself into the sea I decline. I spoke with an old friend recently and asked him if he fancied going for a swim. He told me he would only swim in the ocean during the months of August and September as he had become convinced that voluntary immersion of the body in cold water was an act of supreme folly. (Yes, he really does talk like that). This is the same friend who once challenged me to a swimming race across Lake Bala in North Wales. Not to mention beating me across by a considerable distance! It was many years ago, but I distinctly remember the water being icy cold. Like most of the sensible advice I’ve been given over the years, I ignored it, but recent events have caused a rethink. I’d initially bridled at the allegation of ‘showing off’ as there was nobody around to show off to, but maybe he had a point. New Year's Day is a bit of a disappointment, as far the weather is concerned. It was lovely first thing, but then turned cloudy overhead and the sea looks distinctly uninviting. Even so there are plenty of hardy souls clustered around a couple of camper vans serving hot drinks and refreshments to all when we roll up to take on our onerous duty as spectators. ‘Come on, get your clothes off,’ a complete stranger demands of me, the shameless hussy. I’m unable to respond having crammed a whole sausage roll into my mouth. ‘Don’t you dare,’ hisses Marigold, her concern surely arising from uncertainty as to which underpants I’m wearing than concerns over my wellbeing. My favourite ‘comfy pants’ have long since been reborn as ‘dusters,’ but yes there still do exist a pair or two best kept hidden from public gaze. Clean and perfectly serviceable garments, but not easily confused with those of a fashion conscious modern male. 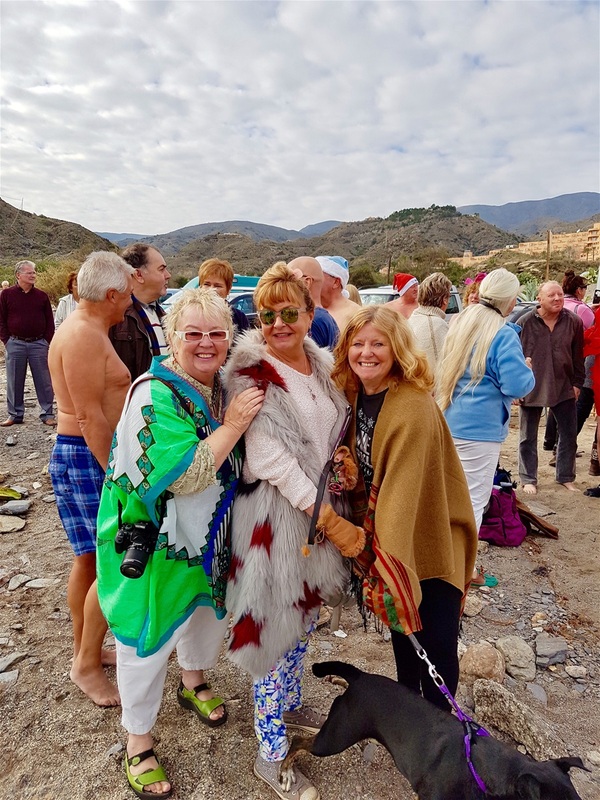 I have no swimwear about my person and even though I’m often mistaken for a man wearing fancy dress when dressed in my normal fashion I absolutely don't intend to enter the water. ‘There are sausages under the kitchen foil,’ Marigold says and immediately my mind turns to gluttony. An icy dip in the sea or hot sausages? It's a no brainer, isn't it? 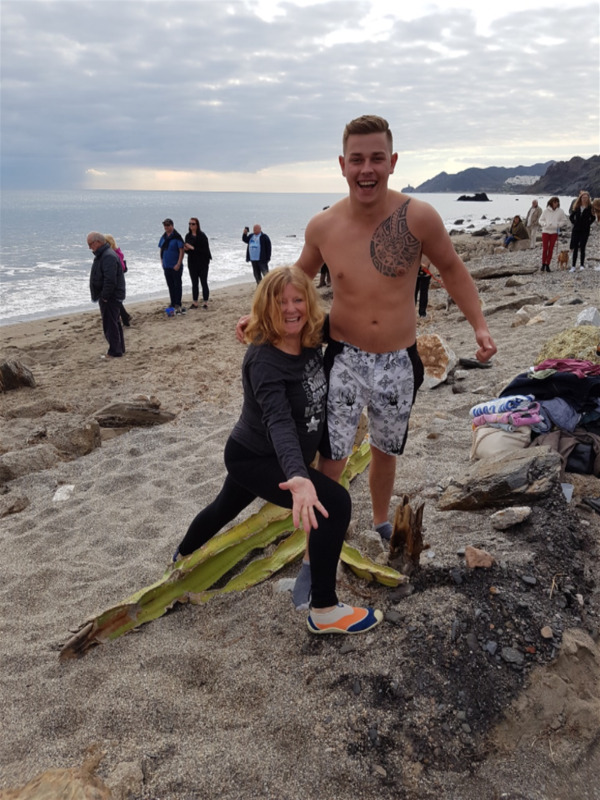 By coincidence, I discovered an article on cold water swimming in the online Weekend section of The Telegraph on New Year's Eve. Two quotes in particular took my attention. ‘Open water swimming is now one of the fastest-growing participation sports in the UK. 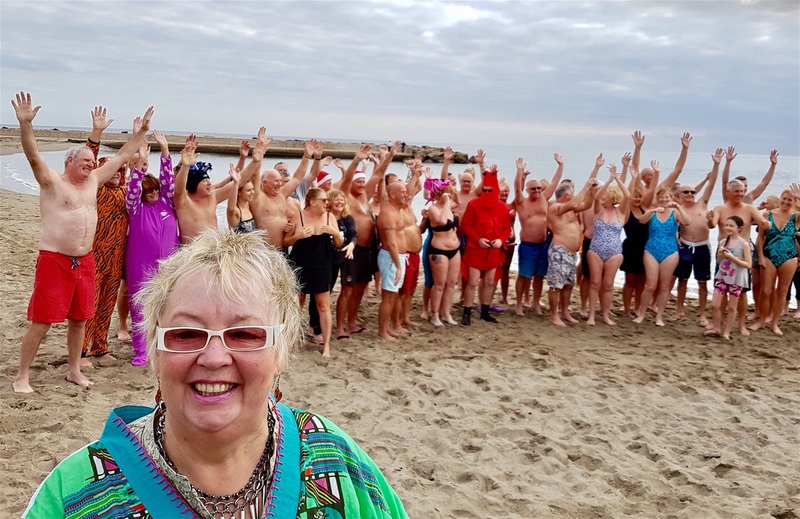 The Outdoor Swimming Society have seen their membership soar from 300 in 2006 to 23,000 members this year.’ Okay, so it's trendy, but hang on, here comes a scientist firmly in the ‘let’s be sensible’ camp. 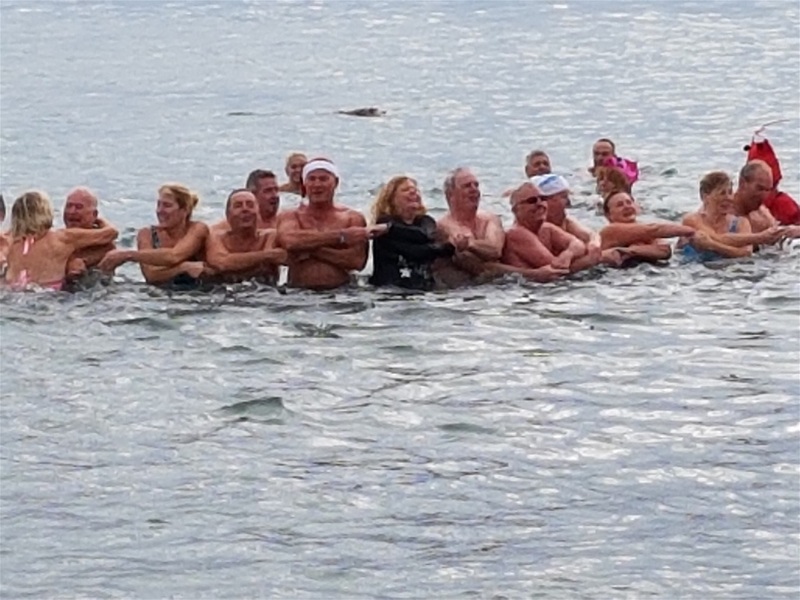 Obviously, I’m the only Daily Telegraph reader here as there's quite a crowd ready and willing to throw themselves into the sea and splash about. 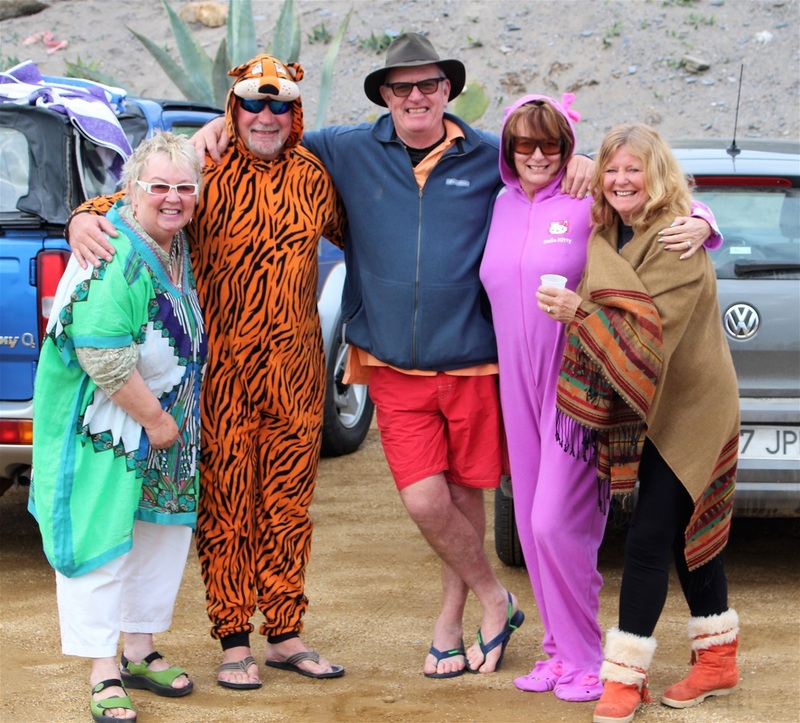 A man in a thong, a terrifyingly fit 82 year old and several ‘onesie’ wearers – finally a reason to wear such a garment. So, I can be trendy and follow the herd – appalling prospect - or return to my roots as a ‘tropical air-breathing primate’ which seems a good deal more enticing. Ah, decisions, decisions. What I’d really needed of course was a short sharp shock to make my mind up and sure enough, a couple of weeks ago, I’d had one. 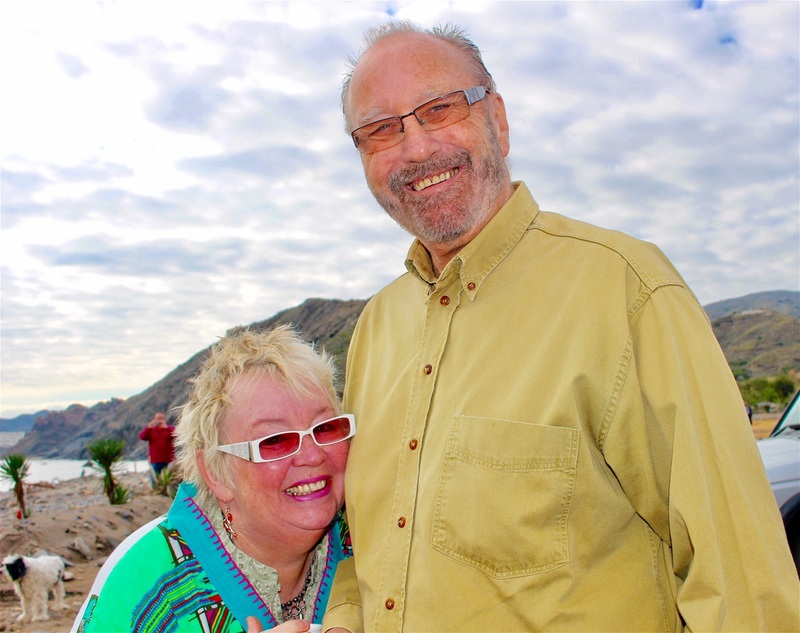 We’re in an apartment just back from the shore of the Mediterranean. 100 metres from terrace to sea, give or take a centimetre or two, and the early morning views from the promenade over the still, blue water are spectacular. Last time I swam in the sea, in Cornwall a few months back, it was a pleasant sunny day and the water looked SO inviting. It took no more than a minute for me to realise the fluidity of my front crawl stroke had gone the same way as my hair, hearing and eyesight. Namely, downhill. Even so, I managed to swim around for a while without having to be rescued or disgracing myself unduly. I plonked myself down next to Marigold on the garish beach towel neither of us can remember seeing before it emerged from the car boot with the rest of the detritus after a lengthy trip through southern France. I can say with absolute certainty neither of us would ever have purchased such a vulgar object, but it's ours now, so we use it. ‘Did I look like a young Mark Spitz out there?’ I enquired. Marigold didn't appear to have been unduly impressed and became even less so when I somehow managed to trail half the beach back with me and deposited it on the beach towel. The other morning I woke early and wandered down to sit on the shore and watch for the dawn. When it was light enough to see, the source of the splashing I’d noted with some curiosity was revealed. Way, way out to sea, a lone swimmer was churning the water into foam. Early mornings aren’t good for me. I make rash decisions with the arrival of a new day. So it was today. 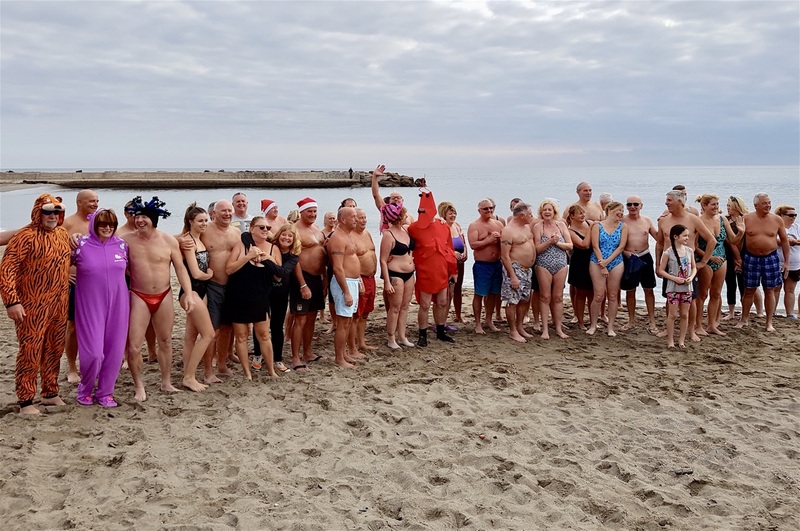 In the absence of my normal swimming attire – not to be found in any exotic swimwear catalogue – and forbidden by Marigold to be worn unless we don't know anybody around us, I decided underpants would suffice. Even when tinged a rosy hue by the rising sun, the water looked and even smelt cold. Inwardly chastising my cowardice I set off for a rock jutting out boldly into the Mediterranean. 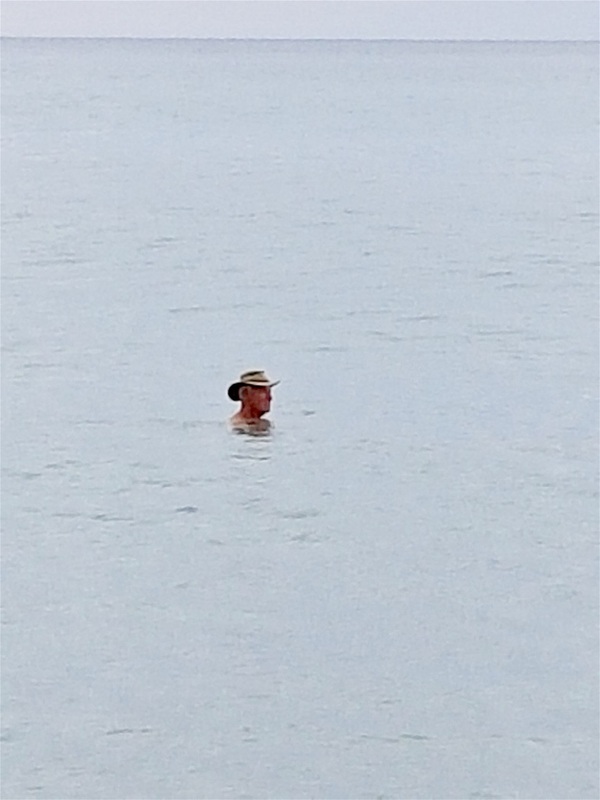 I looked again at the undaunted swimmer in the distance and did what every red-blooded male would do: sat on the rock and lowered myself slowly into the water. That tricky depth, twixt thigh and chest, and certain effects were swiftly evident. The water was cold. Very cold. I’ve swam in lakes fed by glacial water in New Zealand. Not a complete wimp. Even so, that was a few years back now. Extreme cold sends messages to the body of an adult male. Half the readership will know what I mean. Those delicate yet necessary gonads don’t like the cold. They retreat to a place of safety. Without over-stressing the extent of this retraction, it was the first time I’ve had three Adams apples! A further gentle pace or two was quite enough. I stood with just my head showing as if impressed by the majesty of the deep in case anyone was looking and watched the swimmer draw near. Was this it? The day I officially and finally succumbed to being an ancient? Surely this lone swimmer must possess super powers. As he came ever closer, the awful truth emerged. ‘The cheating swine’s wearing a wet suit,’ I muttered. He waved as I was clambering out, slithering ashore like a beached blue whale, chilled to the bone and strolled off, unravelling the top of his suit and seemingly as relaxed as a man who’d just stepped from a warm bath. We’d noticed him in passing yesterday, jogging, shirtless, along the beach and I’d especially noted his garish shorts. Tall, bearded, young, slim, lithe, sculptured cheekbones, obviously very fit and in my wife’s view, extremely good-looking. So, rather like myself then. Oh, come on. I nailed the first two and two out of eight ‘aint bad. Marigold had joined me as I was drying myself off using my shirt, still trying to get warm and with sopping wet underpants clinging to my skin. I looked at a face completely free of guile and wondered how she managed to compress so much irony into a few simple words. Chattering teeth spared me the trouble of a response. On turning to leave the beach I somehow managed to place my left foot into a shallow depression, wrenching the ankle which has only very recently recovered from torn tendon damage. Hobbling, wincing, shivering and dripping seawater behind me I somehow made it back to the sanctuary of our apartment. After a hot shower, the luxury of dry underwear and a mug of coffee I was restored to my former majesty. Or so I thought. Marigold had other opinions to share. ‘I’m raging against the dying of the light,’ I affirmed. Marigold gave me one of those looks she reserves for special occasions. ‘Perhaps you need to rage a bit more sensibly,’ she said, slipping me a biscuit to dunk in my coffee. Has acquiring common sense made G taller? Marigold looks happy. Liverpool 1 Man City 0. 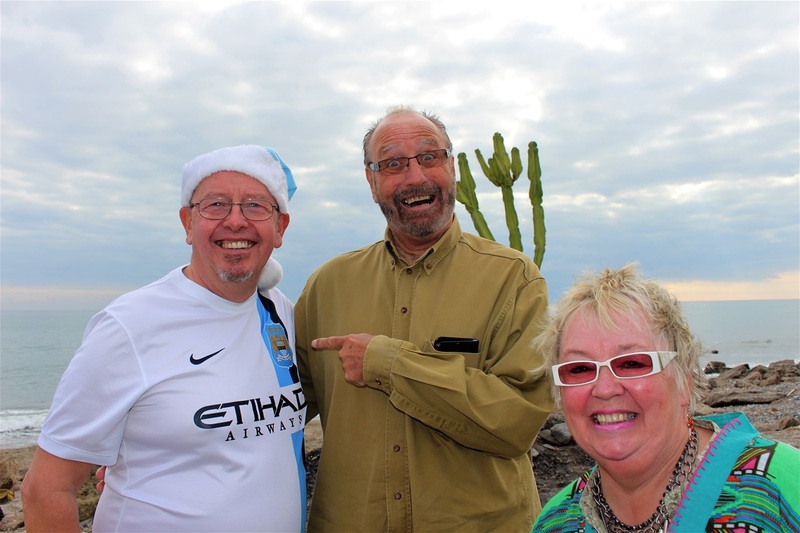 G very happy to find a City fan on the beach. Collective noun for certifiable adults? Nut hatchery? Man asleep in deckchair when the tide came in? Is there a tiny hint of relief here?